Location and Surroundings-Population-Early Settlers-Manufacturing Enterprises-Early Hotel Keepers and Merchants-Borough Organization and Officials-Postmasters and Physicians-Newspapers-Schools-Churches and Secret Societies. Covington borough, created in May, 1831, was taken from Covington Township, and is one of the oldest boroughs in the county. It is situated on both sides of the Tioga River, the valley of which is between one-half and three-fourths of a mile wide here, and nearly level, affording an excellent site for even a much larger place than the borough has grown to be. The area embraced within the borough limits is less than a square mile, the residence portion of the place extending on the south into the township. The public square and business center is at the crossing of the Williamson road, which runs north and south , and the State road which runs east and west. The former road was cut through the Tioga valley in 1792-93, and the latter from Towanda, Bradford county, to Wellsboro , in 1808. At the crossing of these roads the village grew, taking the name of “ Covington Four Corners.” The tide of travel being over these two great thoroughfares, it soon became a place of importance and was at one time the largest village in the county, having no less than three hotels, besides several stores, shops, mills and etc. After the completion of the Tioga railroad in 1840, it was the point from which freight for Wellsboro was shipped overland, and continued so until the building of the Fall Brook railroad to the later place. Though lacking much of the bustle and activity of former years, it is still a good business point, being in the midst of a rich, well-cultivated ,prosperous and productive portion of the county. In 1870 it had 315 inhabitants; in 1880,343, and in 1890,496. Mr. (Isaiah) Washburn, Mr. Elijah Putnam and Mr. Mallory settled at Covington “corners” previous to 1806. Mr. (Aaron) Bloss and Mr. (Josiah) Hovey had settled about the year 1801 two miles below. Mr. Sackett also lived near the same place. The land titles were for a long time in dispute between Connecticut and Pennsylvania claimants. When at last they were settled in favor of Pennsylvania, or “Pennamites,” as the “Connecticut Boys” called them, Mr. William Patton came in as their agent and laid out the town, about the year 1822, and started a store and tavern. For some years the place increased very slowly and was known as the corners. In 1831 it assumed the dignity of a borough. The first person to settle permanently on what afterwards became the borough site, was Elijah Putnam, who bought a tract of land, partly within and partly east of the borough limits. Peter Kelts, who had previously located at Mansfield, came soon after Elijah Putnam, whose daughter Sally, he married January 1,1818. Isaac Walker came from New Hampshire in 1813, reaching the borough site July 4. He settled on the farm west of the river now owned by Charles Howland. John Conrad Youngman, the first hotel keeper, came before 1812.The house kept by him stood on the northwest corner of the square. Christopher Huntington, the first blacksmith, was here as early as 1814 or 1815. His name appears on the assessment list of the latter year. Elijah Gaylord came in 1820, and located near the old sash factory. He afterwards removed to Blossburg, where he passed the remaining years of his life. Samuel Barber same in 1825. He kept the hotel, established by Youngman, for a number of years . Ephraim B. Gerould, a native of Newtown, Connecticut, came about 1825. He built the first saw-mill in the borough and became prominent as a lumberman and merchant. In 1820 Thomas Dyer came from Amherst, New Hampshire, and settled in the southern part of Richmond township. About 1835 he moved his family to Covington. His son, Edwin, soon afterward opened a store here and became the leading merchant and foremost citizen of the place. In 1837 Ira Patchen came from Bath, Steuben county, New York, and opened a gunsmith shop, continuing in business until his death, April 11, 1895. The above named were the principal settlers during the earlier years of the borough’s history. Others there were who came and remained temporarily, belonging to the restless class, who followed up the pioneers, and found more interest and excitement in making new locations than in settling sown permanently in any one place. They belong to a large class who have left but a fleeting memory behind them, but who were, nevertheless, adventurous and daring, if not at all times as enterprising and industrious as those who remained and assisted in the upbuilding of town and country. The assessment list of Covington township for 1818 shows that William Patton, Proprietor of much of the land now embraced within the borough limits, was the owner of a saw-mill. The exact location of this mill cannot now be determined. It stood in Mr. Patton’s name until 1819, when it appears to have been transferred to Peter Kelts, son-in-law of Major Elijah Putnam. He was succeeded by as owner, in 1823, by Thomas Prosser, who owned it until 1825, when it disappears from the assessment list altogether. In 1823 Hiram Thomas, “ tanner and currier,” located within the borough, and in 1830, established a “ tan yard,” to which he added the business of shoe making in 1831 He operated it until 1833. A tannery was established on the site of the post office building in 1830, by George Knox, Sr., in which his son, George Knox, Jr. worked as “tanner and currier.” I1839 this tannery became the property of John G. Boyd, S.S. Cleaver and L.C. Levalley. After Mr. Boyd ‘s death, in February, 1842, the partnership was dissolved, and the business discontinued. In 1843 L.C. Levalley and Ephraim B. Gould erected a tannery near the present saw-mill. About 1849 they sold it to Isaac Berry and Thomas Jones, Who carried it on until 1868, when it shut down. In 1830 John Gray, who had one-half interest, Pliny Burr and Ephraim B. Gerould, each having one-fourth interest, erected a saw-mill on the west side of the river, where the present mill now stands. Within a year Mr. Gerould acquired Burr’s interest. Gray’s interest was acquired by Richard Videan, who soon sold to Edwin Dyer. Mr. Gerould appears to have acquired Mr. Dyer’s interest, and to have operated the mill until his death in 1845, after which his son, Otis G. Gerould, carried on the business until 1879, when H.S. Fick purchased the mill. He sold it a few years later to Lorenzo Doud, the present owner. Three mills have been destroyed by fire on this site. The one now standing was erected in 1866. It is a water-power mill, with an old fashioned, up right saw, and is devoted to sawing for local demand. In 1831 James Weeks established a fulling-mill between the old Knox tannery and the river. This, a few years later, developed into a woolen factory. In 1837 Edwin Dyer and E.B. Gerould acquired the property , which, in 1839, was purchased by John G. Boyd. After Mr. Boyd’s death, in 1842, the enterprise appears to have been discontinued. About 1843 Asa Crandall erected a factory in the southern part of the borough for the manufacture of furniture, making a specialty in bedsteads. He carried on the enterprise until a short time before his death, in 1850. In 1845 Edwin Dyer erected a building, intended for a foundry, beside the railroad, at the crossing of the State rd. The depot burned that year, and has since been used as a passenger and freight station. The idea of starting a foundry was abandoned. About this time, also James Weeks established a woolen factory, between the old Boyd& Cleaver tannery and the river. This was run successfully for a number of years. In 1866 George A. Spring came to Covington from Washington, D.C., and established a bottling works in the building now occupied by Robinson & Morris. A few years later his father-in-law, Jacob Hartman, became associated with him, and the business has since been carried on under the firm name of Hartman & Spring. They manufacture soda and mineral waters, and have a large trade, especially in the summer season. In October, 1881, Bennett & Spring erected a fruit dryer and evaporator, which they operated up to a few years ago, during good fruit seasons. The uncertainty of the fruit crop, however, lead to an abandonment of the enterprise. The building is now used by the Standard Oil Company, who have recently established a distributing station in the borough. Early Hotel Keepers and Merchants. About 1815 John Conrad Youngman began keeping hotel in a building erected on the northwest corner of the square. Among those who kept this house after Mr. Youngman, were Samuel Barber, who took charge in 1825; William Hagenbach, F.E. Young, Benjamin Phillips, Phineas Cleaver and Thomas Graves. Each landlord added something to the building, until in time it became a large three- story structure. It was destroyed by fire about ten years ago, being vacant at the time. About 1819 another hotel building , long known as the “Salt Box,” was erected near the southwest corner of the square . J.O. Pine kept this hotel for many years. In 1835 Aaron Bloss removed from Blossburg and resumed hotel keeping here, continuing until a short time before his death, in March, 1843. It was afterwards kept by Phineas Cleaver and James Husted. In the fall of 1895 the building was torn down. A third hotel was built west of the river by Elijah Putnam. James Porter was the first landlord here. This building, the only survivor of the early hotels, is now used as a tenement house. The Bartlett House, George A. Spring, landlord is the only hotel in the borough at the present time. It was erected by Edwin Dyer for a store building. Pliny Burr, the first merchant, opened a store in 1830.He appears to have discontinued business within a year, and to have resumed again in 1835, in which year, also, Benjamin Kress opened a store. On the assessment list of 1837, Pliny Burr is marked “moved.” In 1836 Benjamin Kress sold his store to George C. Kress. Thomas Dyer embarked in business in 1837. About 1837, also, B.H. Taylor established a store. In 1839 Dyer sold to John G. Boyd. Edwin Dyer began business as a merchant in 1841.In this year, also , the mercantile firm of Packard & Taylor , consisting of Stephen Packard and B.H. Taylor, was formed. It lasted but a year. Packard continued in business alone for several years. Henry W. Graves is assessed as a “merchant” in the list for 1847.He was rich for those days, having $2,000 at interest. O.F. Taylor, who clerked for his brother, B.H. Taylor, embarked in business for himself in 1846, and afterwards became a partner with Edwin Dyer. This partnership was afterwards dissolved. each of the partners engaging in business for himself., Mr. Dyer continuing until his death in 1879. John Calvin Bennett embarked in business in 1849, and continued until his death, January 21, 1889, when he was succeeded by his son, A.M. Bennett, now superintendent of the Elmira Glass Works, Elmira, New York. This store is now conducted by Robinson & Morris, as the successors of Bennett & Robinson. The borough of Covington was created at the May term of the court of quarter sessions in 1831, at which term the borough of Lawrenceville was also created. The first officers were John Gray, burgess; Nathan Paul, Abiel E. Russell, Hiram Thomas, Ephraim B. Gerould and Abner Newland, councilmen, and Calvin M. Newland, constable. Regular borough elections were held and borough officers elected until 1834, the burgesses being James Weeks, 1832; Tilly Marvin, 1833, and Harmon Whitehead, 1834. From 1834 to 1851 the charter of the borough lapsed. It was revived in the latter year, since which time the following-named persons have filled the office of burgess: William C. Webb, 1852; George Knox, 1853; I.C. Bennett, 1854; Edwin Dyer, 1855; Thomas Putnam, 1856; H.M. Gould, 1857-58; Edwin Dyer, 1859; Ira Patchen,1860; John C. Bennett, 1861; Leonard Palmer, 1862; P.P. Putnam, 1863-64; Leonard Palmer, 1865; O.G. Gerould, 1866-67;A.M. Bennett, 1873; Charles Howland, 1874; T.B. Putnam, 1875; R.K. Skinner, 1876; A.M. Bennett,1877; O.G. Gerould;1878; W.H Lamkin,1879; S. Blanchard, 1880; Edwin Klock, 1881; J.M. Hoagland, 1882; T.B. Putnam, 1883; A.M. Bennett, 1884-85; H.S. Fick, 1886; F.M. Putnam, 1887; E.E. Phelps, 1888; Joshua Ingalls, 1889; George Ridge, 1890; John Kendrick,1891-93;O.G. Gerould, 1894-96, and G.S. Harding, elected in 1897. Since the re-organization of the borough, in 1851, the office of justice of the peace has been held by the following named persons: Richard Videan, 1852; Stephen S. Packard,1855; re-elected, 1860, 1865, 1870, 1875; Ira Patchen, 1856, re-elected 1861; Edwin Dyer, 1866; re-elected 1871; Joseph O Price, 1875; J.P. Walker, 1877; O.G. Gerould, 1879; re-elected 1884; L.B. Smith, 1881; re-elected 1886; S.D. Forrest, 1889; Colin B. Clark, 1891; Augustus Redfield, 1892, and John E. Brown, 1895. Thomas Putnam, the first postmaster of Covington, was appointed in 1822. He held the office until 1826. His successor, Ephraim B. Gerould, continued in the office until his death, in 1845, when Edwin Dyer was appointed. His successors have George Knox, David Caldwell, who held the office from 1857 to 1861; Julius Doane, who served for over twenty years; Floyd E. Phelps, and Miss Isabella T. Dyer, who was appointed in July, 1889. The name of “Hyram Cannon, physician,” appears upon the assessment list of 1816, as does also, that of Stillman Cannon, afterwards a practicing physician at Mansfield and Mainesburg. It is presumed they both lived at Mansfield, and that Hiram included Covington in his practice. His name is missing from the assessment list of 1818. Dr. Pliny Power, a pioneer physician of Lawrenceville and Tioga, located in Mansfield in 1819, and included Covington in his practice. Dr Hiram Whitehead located in the borough in 1831 and practiced for a few years and then devoted himself to farming. Dr. George Spratt came in 1835 and practiced several years. Dr. Henry Kilbourne located in the borough in 1840, and for nearly half a century practiced in Covington and Blossburg, residing at different times in each place. Dr. E.S. Robbins, who is still actively engaged in practice, came in 1856. Dr. S. Banks came in 1858, but remained only a short time. Dr. Henry Kilbourne, Jr., began practice in 1859, and continued until his death in 1888. Then came Dr. C.W. Hazlett, Dr. Smith and Dr. Lewis Townsend. The present resident physicians are Dr. E.S. Robbins, Dr. Philemon Rumsey, who carries on a drug store and Dr. S.A. Gaskill. In February, 1888, Dr. S.D. Forrest began the publication of The Riverside Intelligencer. It was issued monthly, and was devoted to local affairs, having also, well- chosen selections for home reading. On August 17, 1889, it was enlarged to a seven column folio, and appeared under the name of the Covington Intelligencer, which was issued weekly until Mr. Forrest’s death, November 15,1892. His widow sold the plant to A. and C.C. Redfield, who issued the first number of the Weekly Monitor, February 3, 1893. In November, !895, C.C. Redfield removed the paper to Painted Post, New York. On December %, 1895, I.R. Doud began the publication of the Covington Record, a seven - column folio, published weekly and devoted to local interests. It suspended publication in the fall of 1896. On January 23, 1897, C.C. Redfield, former publisher of the weekly monitor, began the publication of the Covington Sun. It appears weekly and is devoted to local affairs. The first school in the borough was established as early as 1815, and was sustained by subscription. In 1816 a one-story school building was erected near the site of the present graded school building. After being used many years it was torn down , and a building near the site of the Presbyterian church, which had been erected for a store, was used for school purposes until 1868, when the present graded school building was erected. Until the establishment of the graded school, that portion of the borough west of the river was a separate school district. At the present time three teachers are employed. There is an average of eight months school each year. Among the names of the earlier teachers, still remembered by the living, are those of Joel Harkness, Arminus Fellows, Robert Bailey, Lucy Putnam. In 1841 Prof. Julius Doane established a seminary on the west side of the river, with Miss Lucy Putnam as preceptress. Instruction was given in the languages, higher mathematics, music, etc. It was maintained for three years and had an average attendance of seventy students. The Church of Christ of Covington was organized Elder James Whitehead, October 7, 1829, with the following members: James Whitehead, Hannah Whitehead, Adam Empy, Anna Empy, Norman Lanphear and Joshua Newell. Elder Whitehead served as pastor until 1835. His successors have been James Welton, 1838-42;H.A.Pratt, 1842-44; Ira Brown, 1844-45; M. Buzzell and Calvin Newell 1845-48; Theobald Miller, 1848-53; B.R. Hurd, 1853-55;C.D. Kinney,1855-59; A.G. Hammond, 1859-66; J.G. Encell, 1867-68; J.W.R. Stewart, 1869-70; I.R. Spencer,1870-82; G.W. Headley, 1882-84; J.O. Cutts,1884-87; M.S. Blair,1891, and U.A. White, 1891-96. Rev. Leon J. Reynolds, the present pastor, took charge in January, 1897. On June 2, 1848, the building committee of the church entered into a contract with James Levegood for the erection of a church building on a lot west of the river. The building was erected and dedicated January 13, 1849, being the first house of worship completed in the borough. It is still used, having been kept in good repair. The church now numbers 160 members, and is one of the largest in the county. There are 130 teachers and pupils in the Sunday-school, of which the pastor is the superintendent. The pastors of this church have also served the church at Canoe Camp, in Richmond township. The First Methodist Episcopal Church of Covington was organized over fifty years ago. Itinerant Methodist ministers, it is said, visited the Tioga valley and preached in Covington as early as 1809. The pioneer among these was Rev. Caleb Boyer. Following him came Rev. Hiram G. Warner and Rev. Caleb Kendall. In 1848 a church building was erected, the class then numbering fifteen members. May 9, 1853, the society was incorporated , the incorporators being Joseph Hubble, Richard Videan, Alonzo Barber, Jacob Whitman and L.E. Sampson. Until 1867 to 1884 it was in the same charge with the church at Blossburg. Since 1884 it and the church at Lamb’s Creek have constituted one charge. The names of the pastors are as follows: Ira Smith, 1841-42; Enoch H. Cramer, 1842-43; R.M. Reach, 1843-44;Samuel Nichols, 1844-45; William E. Pindar, 1845-46; R.L. Stillwell, 1846-48; O. Trowbridge, 1848-50; W.C. Mattison, 1850-51; A.H. Shurtliff, 1851-52; W. Manning, 1852-54; L.L. Rogers, 1854-56;J.R. Jaques, 1856-57; H.N. Seaver, 1857-58; R.L. Stillwell, 1858-60; W. Beach, 1860-61; W. Cochran, 1861- 63; W.M. Haskell, 1863-65; Harvey Lamkin, 1865-67;M.S. Kymer,1867-69; Harvey Lamkin, 1870-73; C.G. Lowell, 1873-76; C.H. Wright, 1876-79; R.N. Leake, 179-84; F.E. Van Keuren, 1884-87; W.M. DuBois, 1887-89; F.H. Rowley, 1889-91; D.L. Pitts, 1891-94; Cornelius Dillenbeck, 1894-95, and W.B. Armington, 1895-97. There are ninty members in the Sunday-school, of which J.W. Bradley is the superintendent. C.E. Barber is president of the Epworth League, which has a large membership. The First Baptist Church of Covington was originally known as “The Particular Baptist Church of Covington.” It was organized September 19, 1840, at the district school house in Covington. The original members were Rev. George Spratt, whose labors here resulted in the formation of the church; David S. Ireland, Samuel Morgan, Elizabeth Spratt, Mary Binley, Christina Macomber, Eliza Marvin, Sarah P. Kelts, Maria Marvin, Margaret Ireland, Ann Morgan, and Margaret Harris. The members met in the school house until about 1855, when a church edifice was erected on Main street. A parsonage was erected in 1882. The society existed under its old name until about 1861, when it adopted the rules of faith and practice of the Regular Baptist denomination. The names of those who have served this church as pastors, are as follows: Revs. George Spratt, 1939-45; Abijah Sherwood, 1845-50; Levi Stone, 1851052; D.P. Maryatt, 1852-57; N.L. Reynolds, 1860-65; G.P. Watrous, 1865-72; E.L. Mills, 1875-78; Ross Ward, 178-81; S.F. Matthews,1881-83; A. Tilden, 1883-86; E.J. Lewis, 1886-87; G.H. Trapp, 1888-90; James Jones, 1893-95, and T.C. Davis, 1895-96. The pastor of this church also serves the church at Cherry Flats. 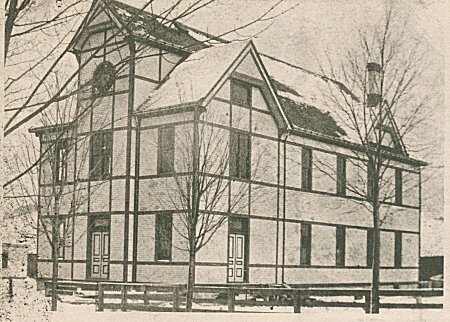 The Sunday-school was organized January 1, 1881. The present superintendent is F.M. Patchen. There is an average attendance of 100 pupils. Mr. Patchen is also president of the Young People’s Society of Christian Endeavor. The First Presbyterian Church of Covington was organized July 27, 1841, by Rev. Julius Doane, Rev. Samuel Hopkins, of Corning, New York, and Rev. Samuel Storrs Howe of Painted Post, New York. The names of the original members are as follows: Joel Harkness and Hubbard Clarke, ruling elders; Mrs. Eunice Clarke, William Clarke, Sarah Clarke, Silas C. Perry, Lucy Putnam, Mrs. Rose Kress, Isaac Baker, and Mrs. Elizabeth Baker. This church has been served by the following pastors: Rev. Julius Doane, 1841- 42; Octavius Fitch, 1843-44; E.B. Benedict, 1851-54; L.K. Beauge, 1854-57; Henry Losch, 1857; J.F. Calkins, 1868; J.A. Rosseel, 1870-71.Sevices were suspended until 1878, when a revival of interest resulted in giving new life to the society. The pastors since that time have been Rev. George D. Meigs, 1878-82; W.S. Carter, 1882-85; George Rogers, 1885-86; J.B. Woodward, 1889-94 and Charles E. Hoyt, who took charge in February, 1894. He is also pastor of the church at Mansfield. The society first met in the “Seminary” building, west of the river. In 1847 the society was incorporated and a church building erected on the lot adjoining the present Bartlett Hotel on the north. This building cost $ 1,763.50. When it was dedicated there was a debt of $890..50, the money having been advanced by Edwin Dyer, who took a mortgage on the property. In 1895 his heirs cancelled this debt and presented the building unincumbered, to the society. Another lot was purchased further south on Main street, and the building removed to it. The church now numbers forty members. A Sunday-school was organized January 7, 1894. It now numbers eighty members. The superintendent is Miss Isabella T. Dyer. The Secret Societies of Covington are as follows: Covington Lodge, No. 274, I.O.O.F., instituted August 10, 1848,has a large membership, and is in a prosperous condition. Emma Colfax Lodge, No. 15, D. of R., was organized September 22,1869, with forty-seven members, and was the pioneer lodge in the county. Covington Preceptory, Local Assembly, No. #00, K. of L., was organized in September, 1881. Washington Camp, No. 626, P.O.S. of A. was organized December 28, 1891, and now contains forty-two members.